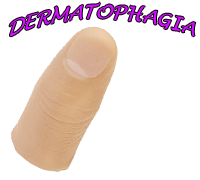 Dermatophagia is derived from two Greek words i.e. derma means skin and phagia means eating. It is a compulsion disorder in which patient behave like gnawing or eating his own skin. Patient mostly eat his fingers and cut down skin with his teeth. Patient bite his fingers and it sometimes leads to bleeding and discoloration. In a worse state, patient can also eat his finger flesh. 1. Patient bite and chew his body skin again and again until bleeding occurs or get damaged. 2. Mostly finger tips are involved because it normally starts with nail chewing. 3. The color of skin turns red due to excessive biting and skin looks raw. 4. In worst condition, bleeding occurs and infection occurs. 5. Damaged skin looks like discolored, scaring and calluses formation. 6. It may initiate with any depressing event and gradually become a part of life. It is more common in women as compare to men. There are some risk factors which may interfere with dermatophagia and make it worse. These risk factors may involve environment full of dirt and pollutants. Age is another factor because this disorder mostly occur at the age of puberty. Stress, anxiety and any kind of mental disturbances also leads to dermatophagia and make it worse. Patient temperament also matters a lot in dermatophagia. As short tempered people can have worst state of dermatophagia.